Thinking of Richard Hunt on what would have been his 67th birthday. Celebrating his life by working on his biography. Thank you, sir, for your work. This entry was posted in Richard Hunt and tagged Jessica Max Stein, Muppets, Richard Hunt. Bookmark the permalink. 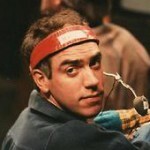 1 Response to Happy Birthday, Richard Hunt! Not sure how I stumbled upon your post but I am so happy you are doing the bio. I was in a high school class with him and he was unforgettable. When it is published please let me know.